Mazda Certified. FUEL EFFICIENT 30 MPG Hwy/24 MPG City! Sunroof, Keyless Start, Onboard Communications System, Cross-Traffic Alert, Blind Spot Monitor, iPod/MP3 Input, Alloy Wheels, BOSE/MOONROOF PACKAGE, Back-Up Camera SEE MORE! All Wheel Drive, Back-Up Camera, iPod/MP3 Input, Onboard Communications System, Aluminum Wheels, Keyless Start, Blind Spot Monitor, Cross-Traffic Alert. Rear Spoiler, MP3 Player, Keyless Entry, Remote Trunk Release, Privacy Glass. BOSE/MOONROOF PACKAGE Bose 9-Speaker Audio Sound System, Centerpoint and AudioPilot, Power Sliding-Glass Moonroof w/Interior Sunshade, 1-touch open. 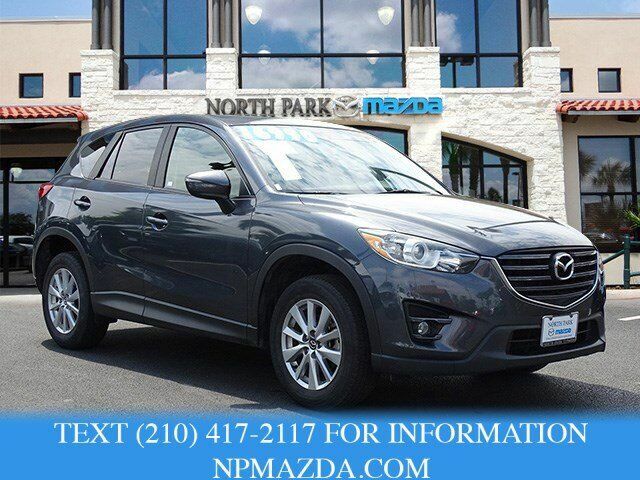 Mazda CX-5 Touring with METEOR GRAY MICA exterior and BLACK interior features a 4 Cylinder Engine with 184 HP at 5700 RPM*. "With its spacious, functional interior, impressive fuel economy and top safety scores, the 2016 Mazda CX-5 is a top pick among small crossovers. The CX-5's fun-to-drive demeanor is just a welcome bonus." -Edmunds.com. Great Gas Mileage: 30 MPG Hwy.